The boss at Three60 Energy said the fast-growing energy services group is still geared towards expansion. Three60 can already cover a lot of bases despite only being launched in 2016 with the backing of Simmons Private Equity. It invested in Malaysia-headquartered Leap Energy in 2016, followed by Aberdeen’s Step Change Engineering and Ridge, of Stavanger. Through those acquisitions, Three60 can provide services in the subsurface, wells and facilities engineering segments, among others. The business has kept a fairly low profile, but is currently looking at potential deals to widen its service offering across the asset life cycle, as well as extending its geographic footprint. “Watch this space,” said Walter Thain, who was recently promoted to the chief executive role, and is responsible for strategic growth, including bolt-on acquisitions. He joined the company as its North Sea boss in May, having previously spent 13 years at Petrofac. Mr Thain said Three60’s “buy and build strategy” was aimed at creating a group that can provide services across the entire asset life cycle. Three60 is particularly focused on appealing to small and medium-sized operators with mature and marginal assets, Mr Thain said. He accepts the company is not going to compete with the bigger service companies for major greenfield projects, but can hope to make serious inroads in brownfield operations. The group has more than 300 employees, including 50 staff members in Aberdeen. The Granite City headcount is expected to double over the next two years and could swell even further through acquisitions. The companies which make up the group – Leap, Step Change and Ridge – will eventually shed their traditional names and adopt the Three60 brand. Across the group, offerings include seismic data reprocessing, marine geoscience, well design and intervention, front end engineering design, brownfield engineering and project management. 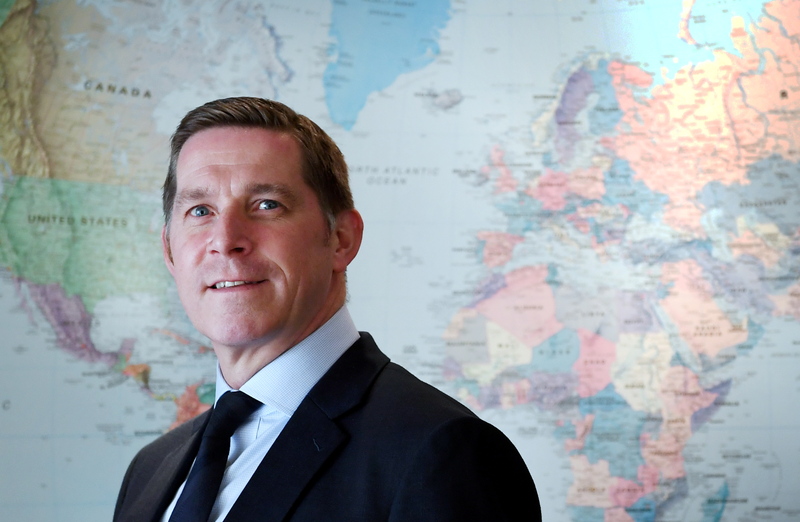 Mr Thain said the North Sea presented a host of opportunities and that Three60’s growth plans had created a buoyant mood among the group’s workforce. It makes a nice change from working for a tier one company which went through a big reduction in headcount during the downturn. Mr Thain said the North Sea had reached an exciting juncture and that people should be upbeat about the challenges industry is facing to maximise economic recovery. “The oil price is stabilising a little and new developments are being sanctioned and some platforms are heading towards decommissioning,” he said. “From a young, small service company perspective we are quite buoyant about the opportunities that we see out there to deliver services. He is also excited by the trend for younger, aspiring operators to acquire non-core assets from oil majors. However, he did accept that the withdrawal of oil majors could have a negative impact on some aspects of technology development. “Assets changing hands is a great thing for the UK market,” he said. “No one buys an asset to decommission it. “The new entrants are ideal clients for us. They buy an asset to develop it and get production efficiency up. “They do subsea tiebacks. That’s great for industry. “The downside of international oil companies (IOCs) exiting is that they do bring a lot of knowledge to the industry, as well as research and development funding. “They try things out globally. If they’ve got a product they want to test, ConocoPhillips or Chevron can run it in 3,000 wells in North America. If it works there, it’ll work in the North Sea so we get the benefit of some of that. Ridge provides a prime example of how the supply chain can transfer information effectively, to the benefit of operators. The well engineering company’s employees are seconded to operators to help solve their problems. Spirit Energy, for example, may only have four Ridge engineers within its drilling division in Stavanger, but they can communicate with their colleagues at other operators if they are struggling to come up with a solution. He said the approach would appeal to smaller operators: “These are not massive organisations, so the supply chain needs to think differently about how they can transfer knowledge to support the SME operators who do not necessarily have as many people around as the IOCs. Mr Thain also said Three60 would give new technologies every chance to prove themselves, rather than going back to old ways of working. “There aren’t as many people around as there used to be,” he said. “If you get into the vicious cycle of needing more people it drives salaries up, drives costs up and that can be a challenge. “I’m not saying it’s all bad because people probably haven’t had pay rises in a long time, so you need to make sure you’ve got the balance right. “People are putting a lot of effort into developing and adopting the right technology to be more efficient. “We feel we’re a vehicle that will give technology a chance. Mr Thain said tier two contractors would appeal more to operators who are looking for “faster and sleeker” services, but that tier one companies still have their place. He said the perception in certain quarters of the marketplace was that tier one companies are more “cumbersome and clunky” and don’t necessarily adopt technology as readily as smaller businesses. “I came from a tier one contractor,” he said. “It’s hard to put your finger on why some people do not like them, other than maybe being a bit sluggish and having a global business to worry about. “Perhaps they are not necessarily focused completely on the UK North Sea. But when you get into mega projects, for example, the provision of a new £300m platform, tier two companies – and we’re maybe tier two-and-a-half – couldn’t do that. “It’s just not in our gift. Mr Thain also said he enjoyed stepping back from some of the extra-curricular roles he took on previously. He said: “When I came out of Petrofac, I was on the Oil and Gas UK board, I led the OGUK efficiency taskforce, I was in the MER forum steering group. “As great as all of those activities were for giving you exposure and getting you hugely involved across industry, it stops you from doing your day job a little bit. “I’m almost back doing my day job and it’s really enjoyable. “I’m out there meeting and talking to clients about different models that might suit them. “We’re not nailed to one business model. We’re more interested in asking how we can bring different parts of our organisation together to fix our clients’ challenges. “Obviously we have to make money. “We’re backed by a private equity fund who will want their cash out at a point in time. “It’s interesting that a number of smaller operators are backed by private equity. “The challenge for private equity is to grow the business quickly.